*Only the lead story in the issue is credited. I assume the credits apply to all of the stories. There’s a note on the first page of this story that says Cheryl’s fashions were designed by Ashley Nicole Findlay of Occee, TN; Justine Young of Honolulu, HI; Robin Hof of Mandimo, B.C., Canada; Mallory Tilley of Weatherford, TX; and Haley Navarro of Brimfield, Mass. Cheryl finds Jason standing in front of the mirror in his bedroom and practicing asking Betty to go steady, which he then amends to going out on Friday night. Jason is a Kizz fan. Cheryl realizes Jason’s got it bad for Betty. Jason believes he sounds like a dork. Cheryl thinks this might be an opportunity in disguise for her. Cheryl knocks on the wall just inside his room (the door’s open) and apologizes for bothering him. He’s irritated to see her. Cheryl sits next to him and gets him to open up by offering to help. Jason’s also a wrestling fan. Anyway, Betty’s always sweet and nice to him, but she never looks at him like she looks at Archie. Cheryl suggests treating Betty’s “girlfriends” well. Jason immediately thinks this is brilliant, hugs Cheryl (who looks stunned and way uncomfortable), and calls her a genius. He goes off to Riverdale. Cheryl smiles and thinks the “first phase of the plan” (which she just thought up) has been started. Later that day, Jason, wearing completely different clothes than he was when he left his room, drives by Betty and Veronica, who are walking along, and offers to give them a lift. Betty smiles and greets Jason. Veronica’s happy to see him, too. Betty explains they were just on their way to meet Archie at Pop’s. Jason takes the time to park his car and get out (I guess they’re in front of Betty’s house). He offers to treat them to a special treat at La Ice Creme. Veronica is surprised. They get in the car and start heading there between panels. Betty is stunned and asks if it’s the most expensive ice cream parlor in the U.S.A., which Jason happily confirms (is he driving them to New York City?). This short conversation took an unrealistically long time to occur, but this is a frequent problem in comics (at least Archies). Back at Pop’s, Cheryl finds Archie alone at the counter, slurping a milkshake or soda float. Cheryl’s happy that her plan is working. Now for phase two: sitting next to Archie and trying to convince him of her heterosexuality while wearing a rainbow crop top underneath a cargo jacket with the sleeves rolled up. Archie mentions Betty and Veronica were supposed to meet him but never showed up. Cheryl doesn’t hide her pleasure. Two weeks later, over a meal, Cheryl notes Jason’s happiness. Jason says he and the girls are having the best time. Oddly, he refers to Veronica as “her friend” instead of by name. Believing Betty’s starting to fall for him, he’s planned something special for tonight. Cheryl says that’s terrific. Jason thanks her and leaves. Cheryl decides to plan something special for Archie and herself. That evening, Archie’s amazed that Cheryl got them front-row seats to a Go-Go Dolls concert. Cheryl calls herself a marvel. 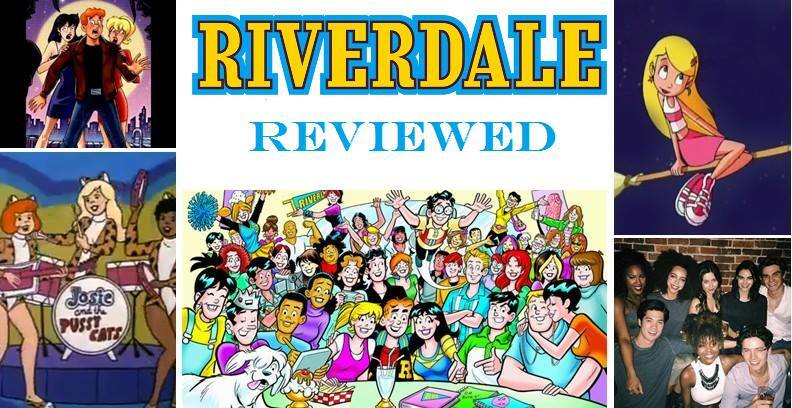 Archie spots Betty, Ronnie, and Jason. He tells the girls that he hasn’t seen them in a while. Betty happily says they’ve been out with Jason a lot lately. Veronica coldly notes Cheryl has been keeping Archie company. Suddenly, Veronica angrily realizes what’s been going on. Betty feels used by Jason. Veronica and Betty storm off from the “related rats” and leave the concert. Archie runs after them. Um, why leave a concert over something this petty? Cheryl calls out for Archie, and Jason calls out for Betty. Back home, Jason forces Cheryl to practice apologizing to Betty in the mirror and taking full blame. It apparently works. This story has a bad ending. Let’s walk through this. Cheryl has Jason show Betty and Veronica a good time, so she can have Archie all to herself (because apparently he has absolutely no other love interests and doesn’t chase after girls left and right or anything). Fair enough. Betty and Veronica abruptly cancel their date with Archie (without notifying him) over the promise of expensive, fancy-shmancy ice cream. They then stay completely out of contact with him for two full weeks and vice-versa (even though this issue came out during the school year). Jason and Cheryl treat their dates to a concert (ever so coincidentally, the exact same one). Veronica and Betty get self-righteously pissed at the Blossoms, and Jason forces Cheryl to take all of the blame. Remind me: who’s at fault? Next Next post: Comics – Faith, Hope and Cheryl!